Sachin Tendulkar scored brilliant 47th century in ODI once again and created new record of most centuries in the World Cup. This century also took him one step near to the great landmark of 100 centuries in International Cricket. Andrew Strauss played scintillating innings of 158 with some luck. Supporting characters tried hard and created big drama but all these great efforts ended without reaching their destination. How often we see such a great cricket match where records tumbled, which fought hard till the last ball with fortunes fluctuating from one side to other and in the end, no side end up fortunate enough to win the contest and what about the spectators, they get their money's but in the end they have to go home without witnessing desired climax of the story which kept them tied to their seats for almost 8 hours. Yesterday night Chinnaswamy Stadium in Bengaluru witnessed the contest which made World Cup alive after a week of its inception. 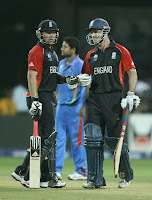 India and England performed brilliantly with the bat but failed to make a mark in bowling and fielding. World Cup 2011 needed this kind of match badly after one week of boring cricket. Both teams given runs like they are playing in a charity match on a surface which had nothing for the bowlers. But I feel in all this run galore both captains made few mistakes which deprived them from winning this great contest. Dhoni did not attack Englishmen too much. Strauss made a mistake by continuing with Anderson in death overs even after he went for plenty of runs. Both teams fielded poorly. If we talk about Dhoni, I already mentioned about his defensive techniques in my earlier posts and once again he repeated the same mistakes and then cried foul over one decision which went against his team. I think when you score 338 runs then 9 out of 10 times you win but for that you have to use attacking strategy and Dhoni failed to attack English batsmen even after putting mammoth score on the board. He opened the field for English batsmen to pick-up easy singles and did not force them to make a mistake. Pietersen, Strauss and Bell took full advantage of Dhoni's strategy and kept picking up singles and odd boundaries without taking any big risk. Dhoni is repeating the same mistakes again and again and because of which Indian team lose the crunch matches. He made mistakes in South Africa where he set defensive field in Test Matches as well as in ODIs and that resulted into drawn test series and ended up losing the ODI Series 3-2 to Proteas. When Dhoni will understand the importance of blocking the singles? In this match it was evident that Dhoni made a mistake by not attacking the English batsmen. Had Strauss not taken that 3rd Batting Power Play then England would have easily won but because Strauss took the Power Play and Dhoni was forced to bring the field in, immediately India team gripped the game by picking up 2 quick wickets because singles were dried up and that forced Bell and Strauss to play rash shots which resulted into their downfall and eventually match ended in tie. Big lesson for Dhoni and his team for the coming matches. Dhoni have to attack there is no other option. If you want to win a game then you have to pick up wickets otherwise you will face the music of opposition batsmen who will make mockery of the defensive field and easily collect the runs and keeps the pressure of run-rate away form them like Bell and Strauss did yesterday and almost took the game away from India. As far as Strauss and England are concerned, I think they were bit lucky to tie this game not because they batted brilliantly but Indian captain and bowlers turned deaf and did not appeal even after Strauss edged the ball when he was on 3 and 111. I think Strauss made a big mistake of taking Power Play at wrong time. They were picking up 8-9 runs easily in the middle-overs but could not resist themselves from going bang-bang by taking Power Play and finish the match in style but to their misfortune, tactic of taking Power Play went against them and they almost reached on the verge of losing the game from the position of strength. Zaheer bowled brilliantly in the Power Play and picked up crucial wickets of Bell and Strauss on successive deliveries . In the next over he picked up Collingwood by cleaning his off-stump and gave India advantage to win the game but once again lack-luster Indian fielding came onto the scene and Indian fielders allowed Englishmen to convert the singles into twos and match resulted into the tie. I don't say India's bowling was that bad in this match. I must say poor strategy of Dhoni and fielding deprived India from great victory. As far as Strauss is concerned bowling and fielding is big worry for him and have to work hard on fielding and bowling before next match if he wants his team to sail into quarters and semis. India also have problems in plenty with the fielding and strategy and have to rectify the mistakes immediately otherwise they will end up on losing side once again. For India, Yuvraj's return in form is a very good sign and this can be a big advantage in coming matches but remember only batting can't win matches. I must say this match certainly lived upto its big hype which was created in its build up.